A two-day Named Data Networking (NDN) Workshop will take place on the NIST campus in Gaithersburg, MD on May 31-June 1, 2016. NIST has ongoing efforts in Cyber-Physical Systems / Internet of Things and Big Data. This workshop will gather representatives from industry, government, and academia to discuss the role that the NDN future internet architecture can play in support of these critical network environments, as well as future content delivery over mobile networks (e.g., augmented reality). Future internet architectures based on the information-centric networking (ICN) paradigm propose to address ongoing challenges in supporting modern applications with IP, especially in networks of diverse and intermittent links. To do so, they effectively bring Web-like semantics to the network layer, directly supporting dissemination of named, signed data. 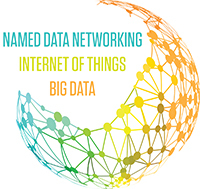 Named Data Networking (NDN) is one such architecture that has a growing community of interest. Given the increasing interest in the Internet of Things (IoT), Big Data, and Future Media, which is driven by their potential for a strong economic impact across sectors, this workshop will examine NDN as an alternative networking approach in these areas. The first day of the workshop is focused on IoT and will feature keynotes by invited speakers as well as presentations and panels. It will explore how ICN/NDN addresses some of the key challenges in security, multi-party communication models, stack and application complexity, efficient resource utilization, and scalability faced by emerging IoT applications. The second day will have a similar format focused on the themes of Big Data and Mobile AR. The following draft agenda will be updated with the complete list of speakers and presentations. Call for posters/demos: We are soliciting both technical demonstrations and posters that fit within the general theme of the workshop. They can either reflect on-going research progress, demonstrate working prototypes, or showcase realistic applications. Abstracts describing the demos and posters will be distributed with the workshop program. If interested please send an abstract describing your demo/poster to ndn_workshop@nist.gov, and specify if any special arrangements are needed for your demo (connectivity, equipment, space, etc. ).